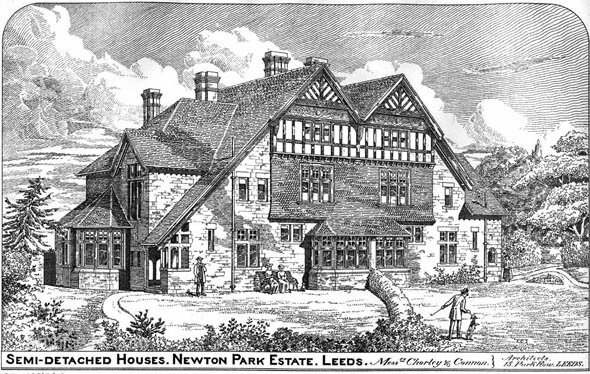 The Newton Park Estate is a Victorian Residential Development, in North Leeds, Yorkshire, UK. 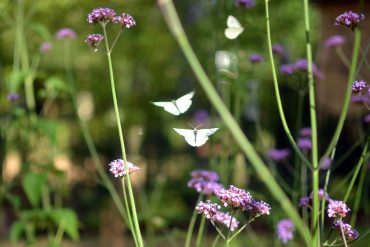 It has been a conservation area since the 1970’s. 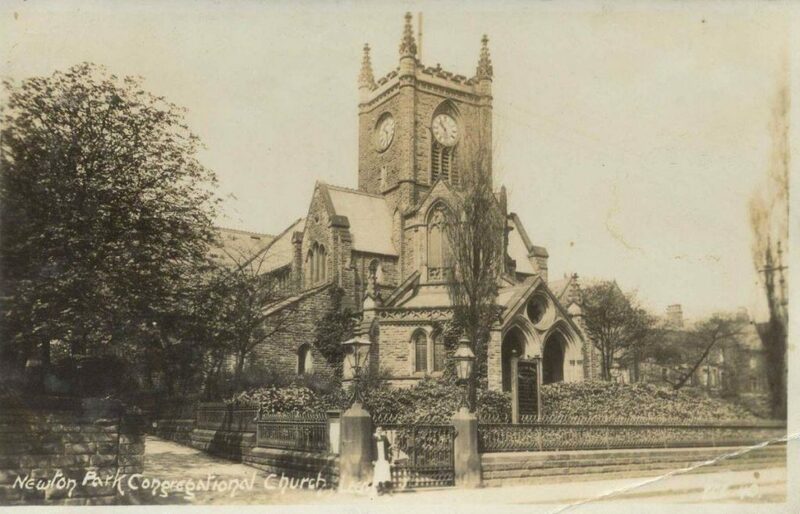 It is now part of the Chapeltown Conservation area., in Potternewton. It is often called by residents and locals as St Mary’s as it is based around St Mary’s Road but it is officially called The Newton Park Estate. 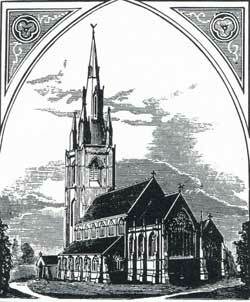 The Newton Park Estate is accessed through an imposing gateway with pedestrian entrances on each side which lends a feeling of exclusivity and formality to this estate.Places of worship punctuate the area, (St Martin’s Church and Union Chapel ) providing a variation of scale and architectural character. Building form varies from detached and semi detached villas to elegant terraces, often standing side-by side. 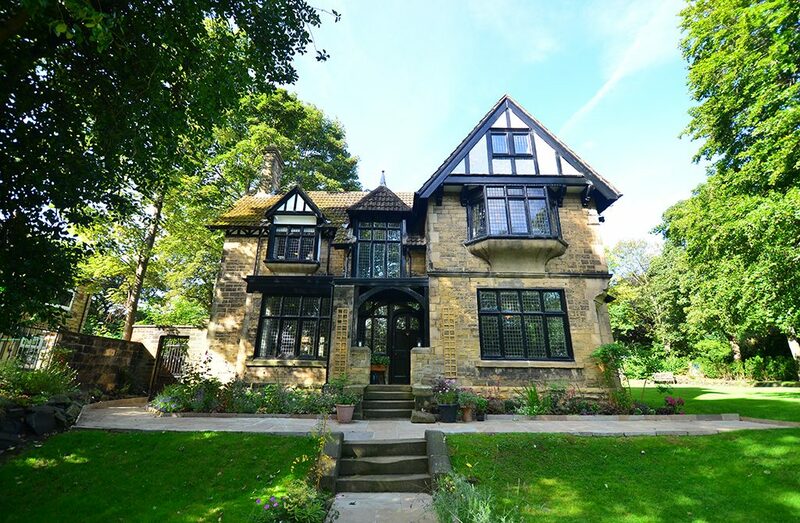 Architectural styles vary from typical late Victorian ‘gothic’ villa type properties, which can be seen in many other Leeds suburbs, to more individualistic Arts and Crafts designs. Sandstone is mixed in some cases with render and tile hanging. Natural materials to some footpaths and carriageways lend a sense of quality and help to unify the area. 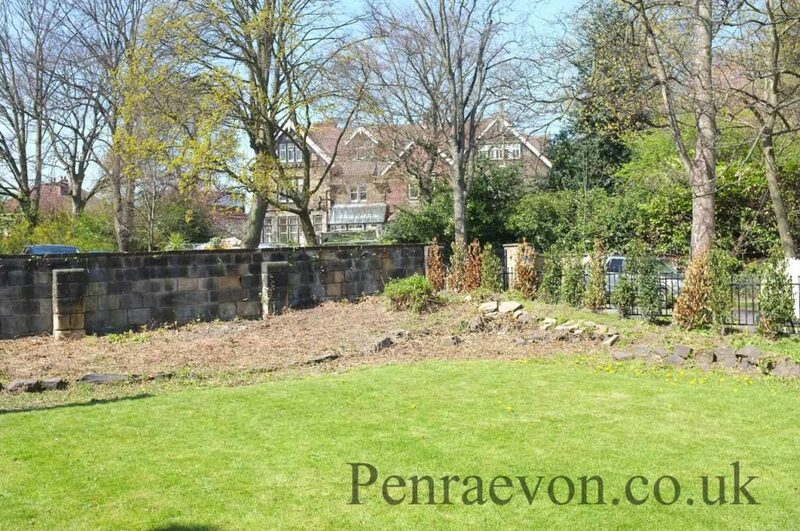 A high stone wall on Chapel Road and continuing north on the east side of Hall Lane and the short stretch of lower wall north of 315 Chapeltown Road (in front of St Martin’s Church) are part of the boundary to Newton Park. 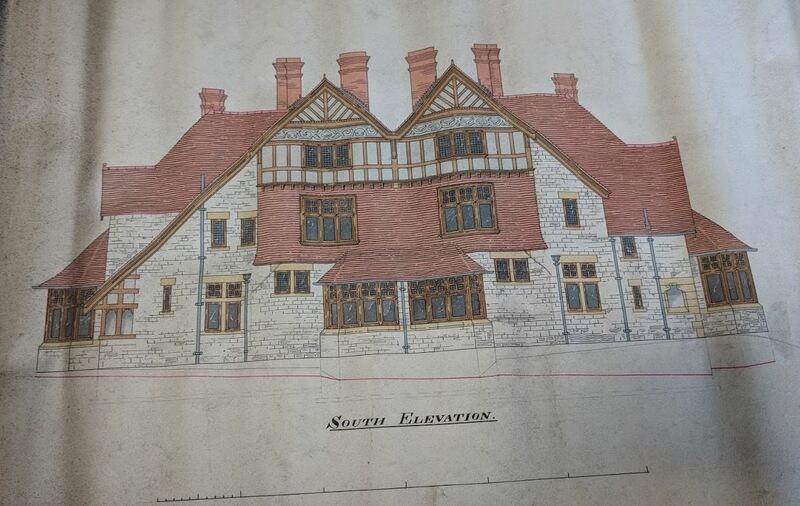 This is of historical interest as well as helping to give the Newton Park Estate a distinct identity. 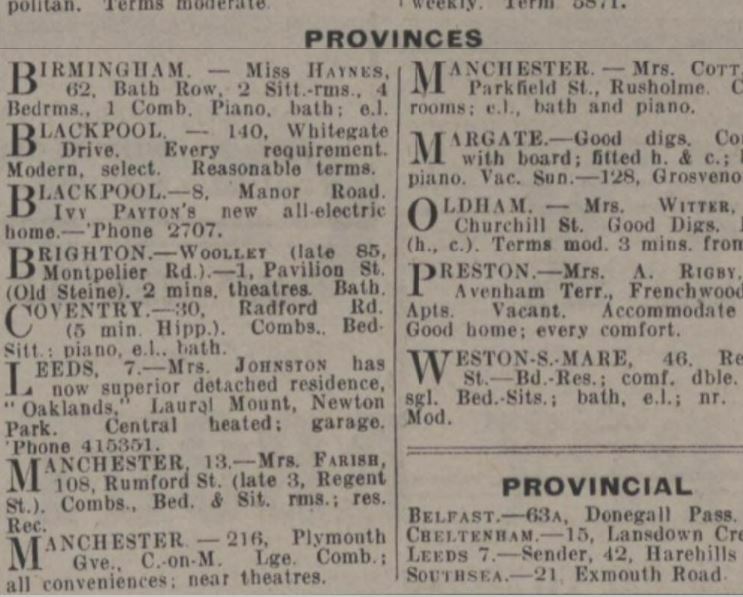 The Estate was also serviced with shops. 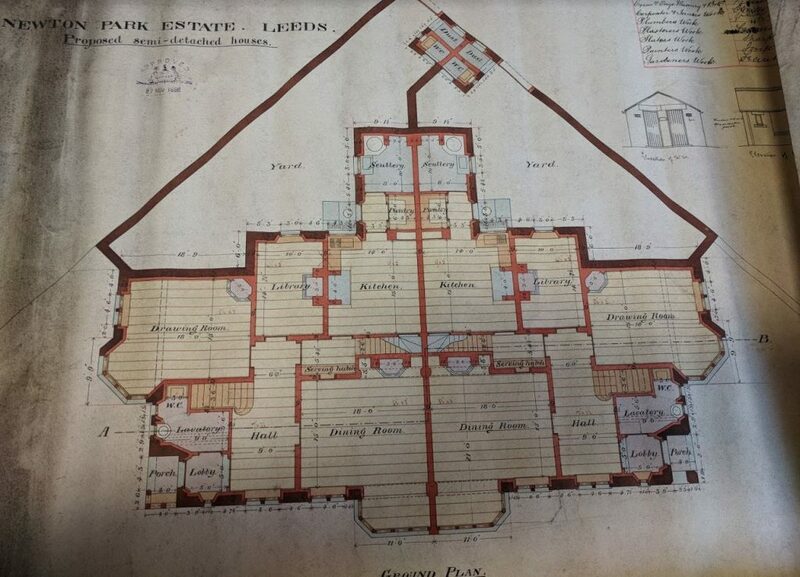 The Estate was given a highly original shopping arcade at nos 168 – 176 Chapeltown Road in 1890 by Archibald Neill. Less wild than his nearby Union Chapel but still bizarrely detailed, the first floor of the central pair of shops set back between each shop transmute above capitals to form tapering buttresses rising above the eaves. Two splendid carved lions perch above the shopfronts at each end. Coursed stone and mullions throughout. 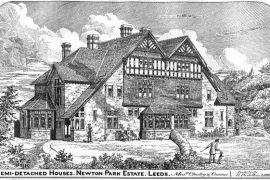 The Newton Park Estate was built on the grounds of Newton hall and was conceived in 1860’s by the Lupton Family. 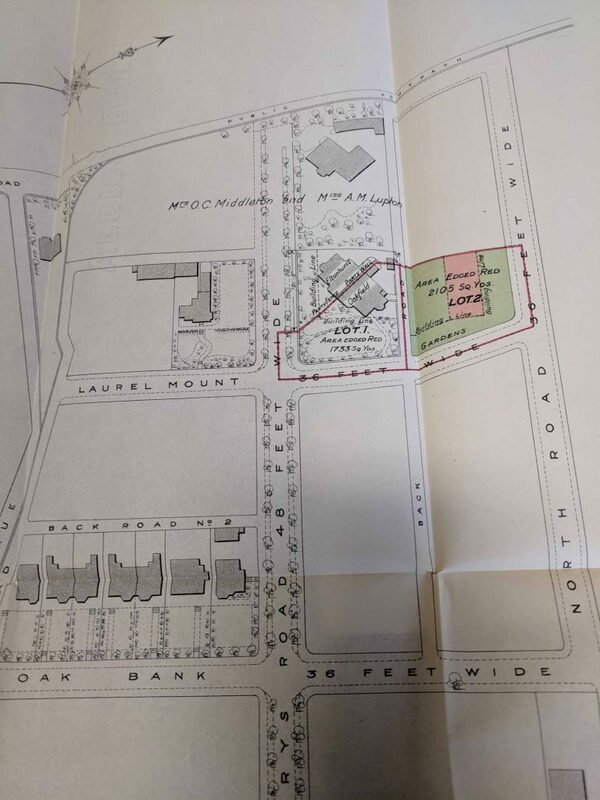 Arthur Lupton (owner of Newton Hall) gives his two brothers Francis and Darnton Lupton a plot of land on the grounds of Newton Hall (family residence) to build homes for their heirs. 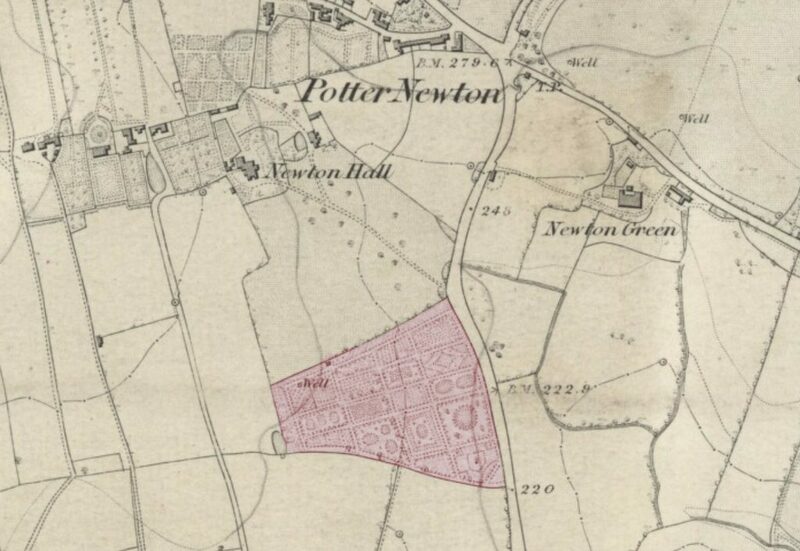 The Newton Park Estate was laid out by the Lupton Family of Newton hall (now dem.). 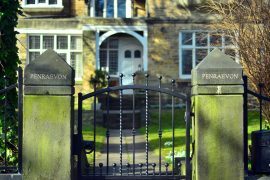 It’s lodge (1856) and gateposts survive on Chapeltown Road by St Martin’s church, which was built for the new estate. 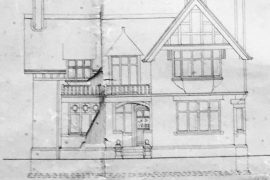 Francis and Darnton Lupton first engaged George Corson to draw up plans for developing their estate at the beginning of the 1870’s but building was only begun in 1879 to plans by Chorley and Connon (who also designed most of the houses). They appointed the leading architect George Corson (who two years later would win a competition for the laying out of Roundhay Park) to produce a layout for an exclusive residential development on the site of a nursery and tea gardens in the south part of their estate, Newton Park, in Potternewton. The Tea Gardens belonging to Newton Hall can be seen (in Red) on this map of 1842. 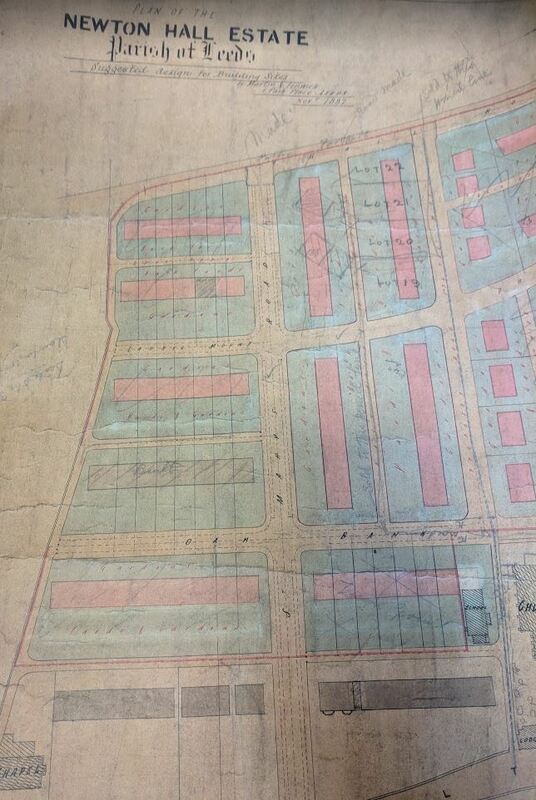 This is the revised plan from Nov 1882 which was still not the final layout which says it is by Martin S Fenwick (?) 1 Park Place. It has lots of scribbles on it. This map held in archive was unfortunately not dated however Arthur Currer Briggs Bought Penraevon which he named Redbank in 1892 and sold it in 1897 when it changed its name back to Penraevon. Therefore this map dates from some time between these dates. The layout is geometrical. 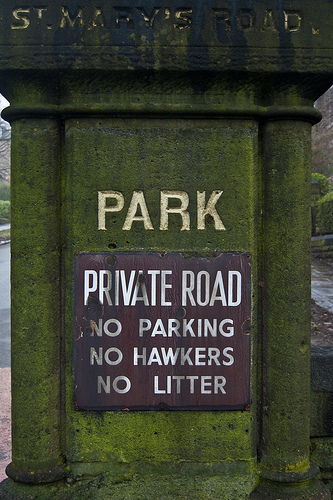 There is an imposing gateway on Chapeltown Road, which has the following notice. Unfortunately nobody seems to take any notice and they all come park and drop litter though not so many hawkers, door to door salesmen seem to be a thing of the past. There are then pedestrian entrances to each side. 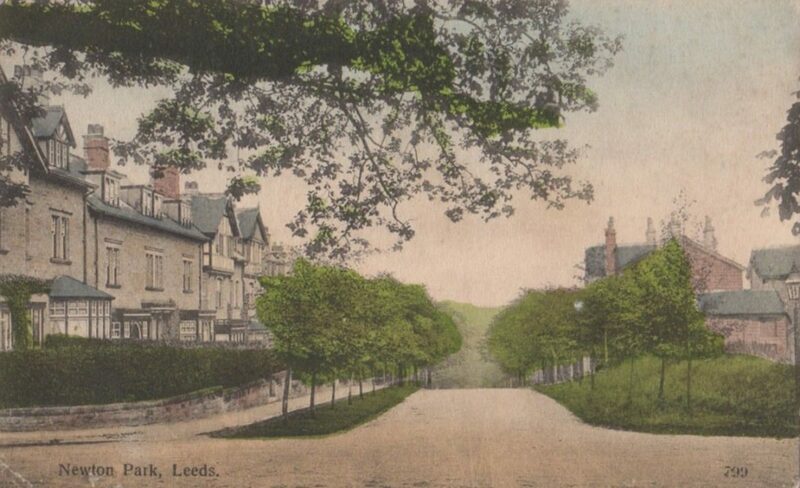 This marks the beginning of the principal street, St Mary’s Road which leads to the largest house on the estate Rocklands (this is now known as St Mary’s House). 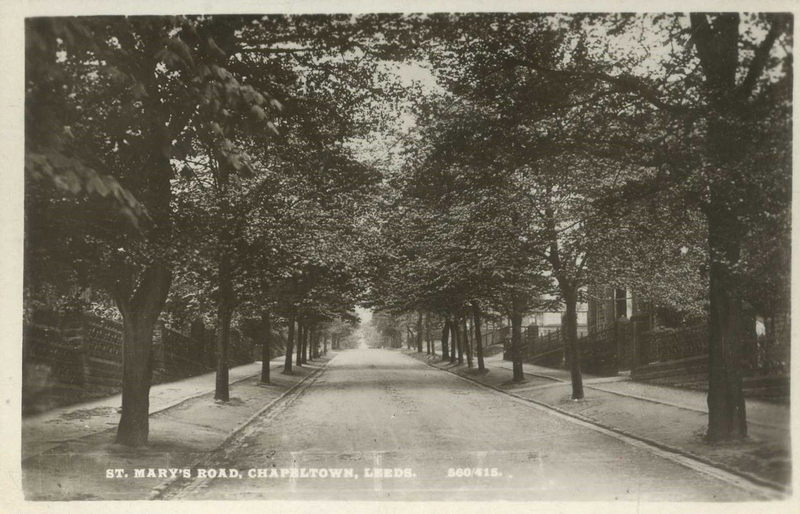 The principal street is St Mary’s Road, a gated street south of St Martin’s Church off Chapeltown Road. 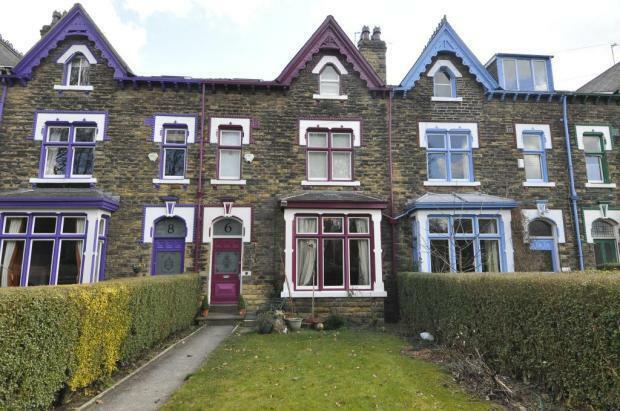 On the right No’s 1-10, a terrace of 1894 by Smith and Tweedle, the houses with similar plans but varied facades whose attractive detailing includes half-timbered gables, paired windows with deep sashes, and shell like porches. St Mary’s Road is a broad street with grass verges which are lined with trees. As you travel up on the right hand side there is a green. 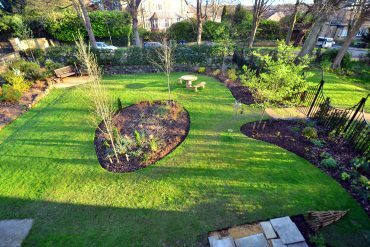 This used to be a tennis court for use of the residents but was subsequently turned into a green. People sit and have picnics in the summer and there are rope swings for the kids. We hold an annual community bbq on the green. 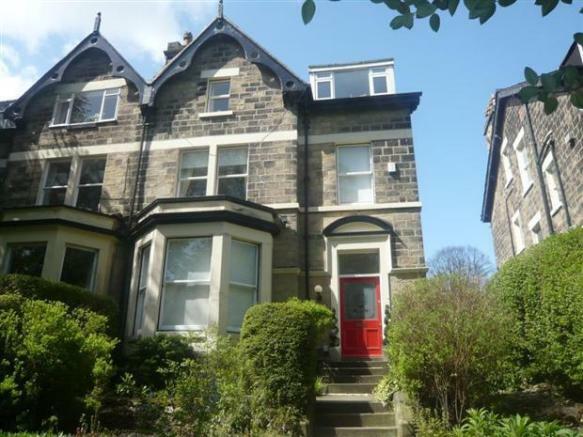 It is then made up of Terraced houses to the North, they are all so different from each other with amazing architectural details such as giant shells above the doors. 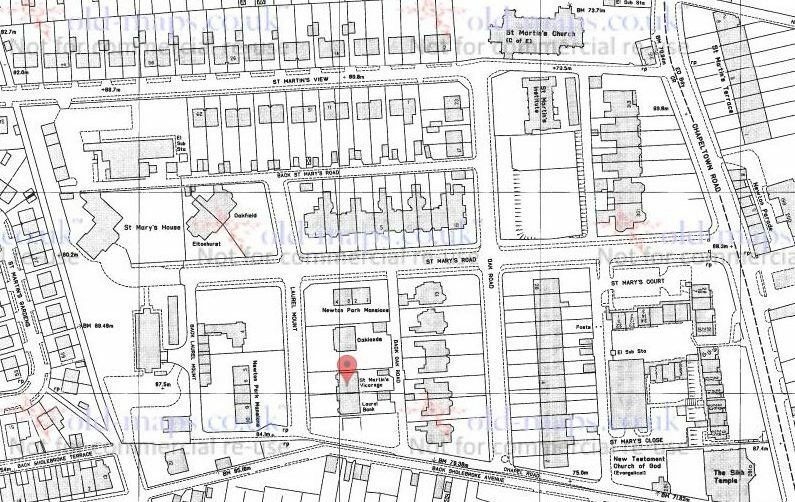 Oak Road East Side, This was the last side to be developed and comprises of very large terraced houses. The houses are all constantly changing colour recently we have turquoise, grey and yellow. Oak road west side is made up of earlier houses either detached or semi-detached large villas built by the Newton Park Building Club. 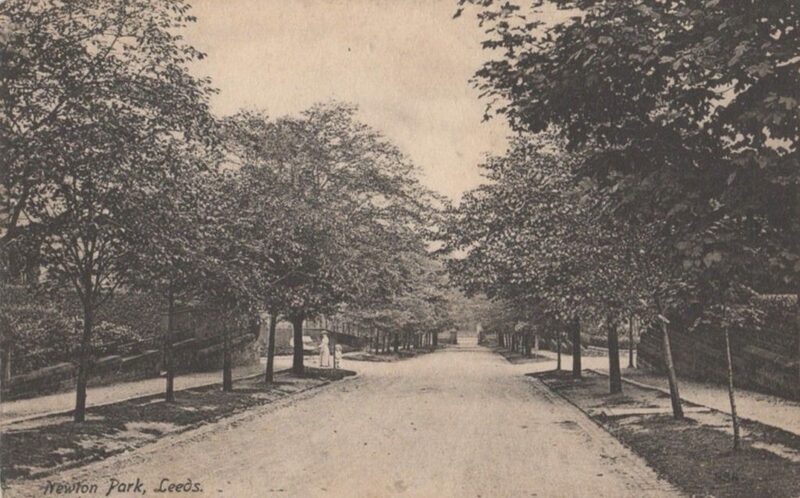 Carrying up St Mary’s road, Laurel Mount bisects the road to the North and South. 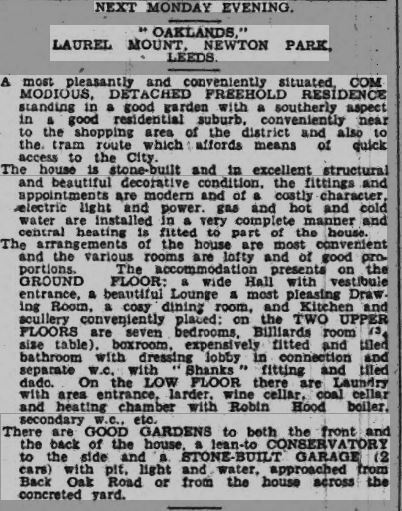 Virtually all the Nineteenth Century houses have been attributed either to Chorley or to Chorley and Connon. 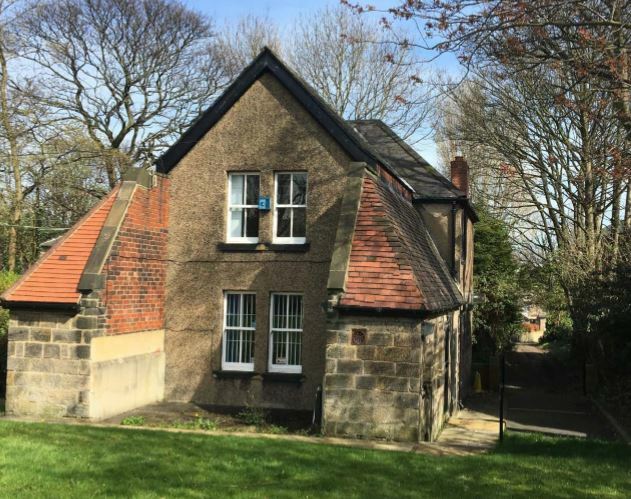 According to Janet Douglas in Building a Great Victorian City – Leeds Architects and Architecture 1790-1914 when talking about the Newton Park Estate. 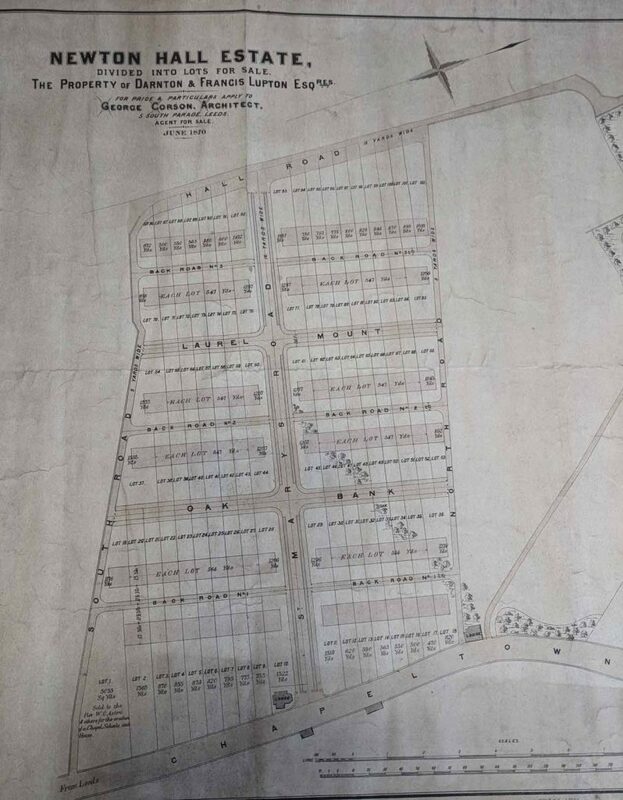 This map from 1920, but obviously taken from earlier deeds as it does not show all the houses which were built by then, was produced when Oakfield and the land to the North was put up for sale 8th Jan 1920. The most attractive is Penraevon of 1881 in Laurel Mount. Again Domestic Revival but in stone, with a half timbered gable above an oriel window, leaded lights and a pretty timbered porch. 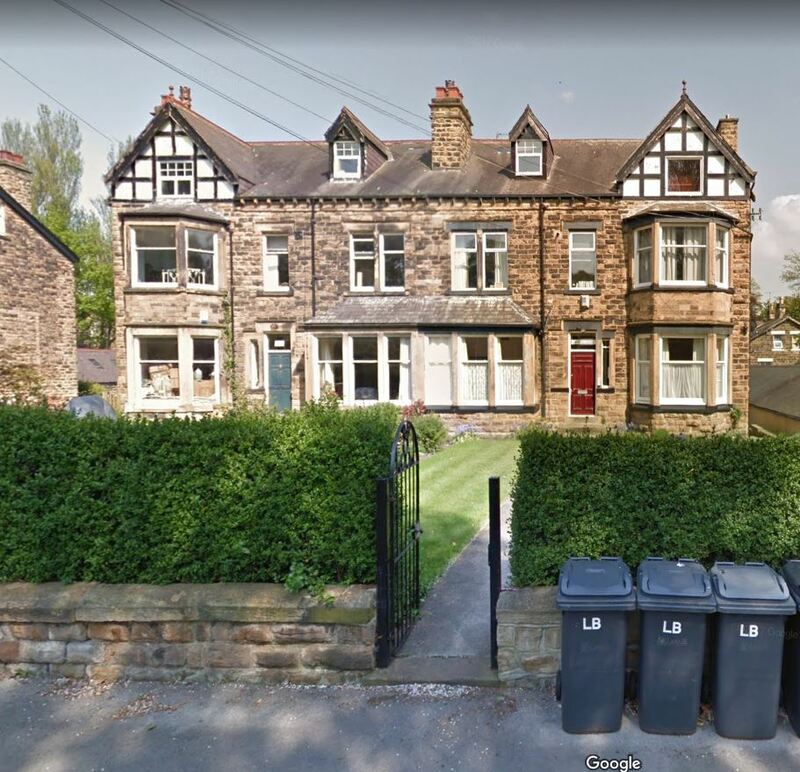 lived in by the developer who built it, until the 1920’s and then it was the home of the Heaton family The heaton Family owned a large clothing Empire including the Heatona Building on North Street (now Crispin Lofts). 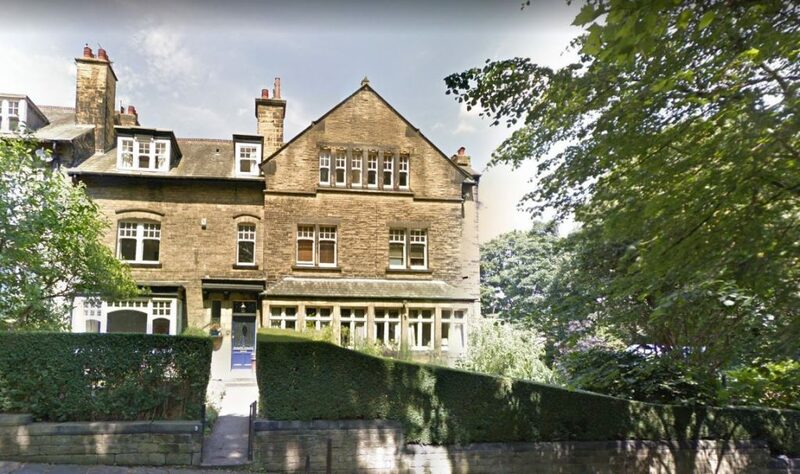 It was sold in 1937 and became a boarding house for theatricals. Rumour has it that Stewart Granger stayed here. 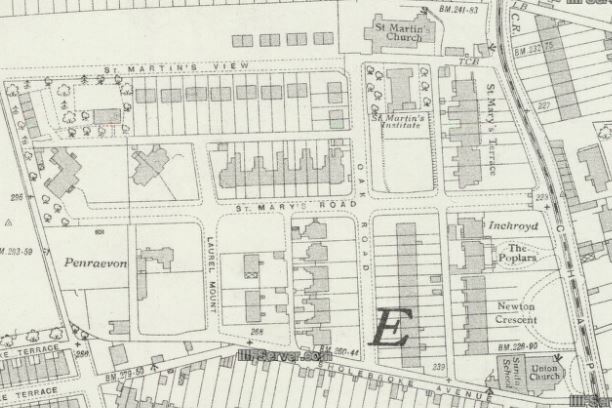 Next is the semi-detached villas called The Old Vicarage – which was of course the Vicarage for St Martins Church, (though it does seem to have moved around) it is now a family home and Laurel Bank which is flats. 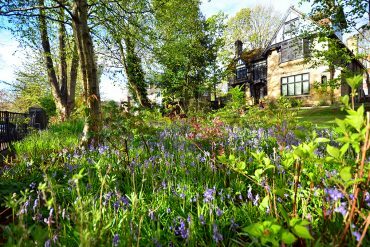 In the 1920s, Newton Hall, the ancient residence of the Lupton family, which adjoined the northern boundary of the area, was demolished and the extensive grounds surrounding were built over to create the St Martin’s. 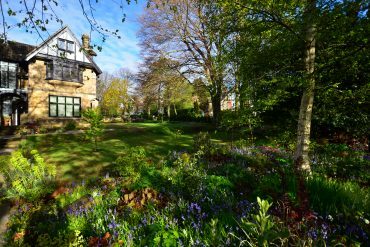 Around this time the two blocks of houses called Newton Park Mansions were built, in stone with slate roofs and shared gardens. 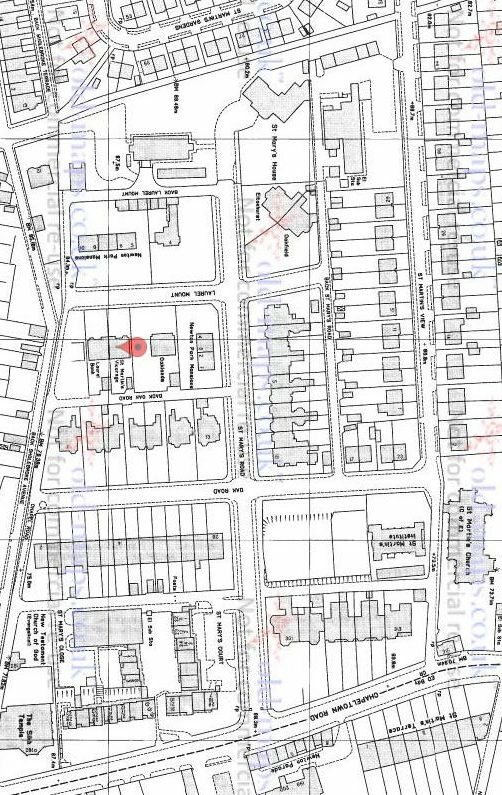 The mansions are split into two blocks one more on St Mary’s Road is number 1-4 and the other on Laurel Mount are numbers 5-10 which as you can imagine confuses ALL delivery drivers and Taxis. 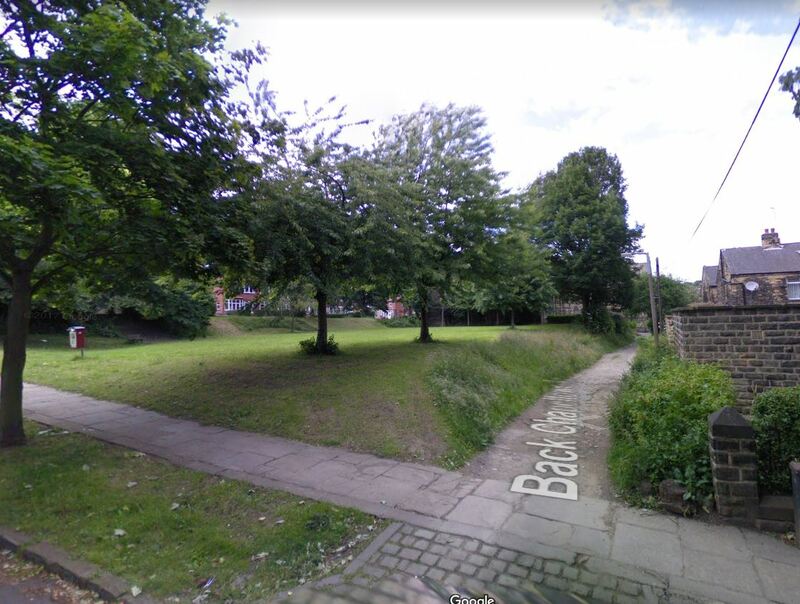 All of the main streets have a back road too (Back St Mary’s, Back Oak Road, Back Chapeltown Road) but only Back Laurel Mount has dwellings that are not on one of the main streets. Back Laurel Mount is home to The Stables and also at the end Rockland’s Cottage (now called St Mary’s Cottage). The Stables are, not surpisingly, converted Stables. 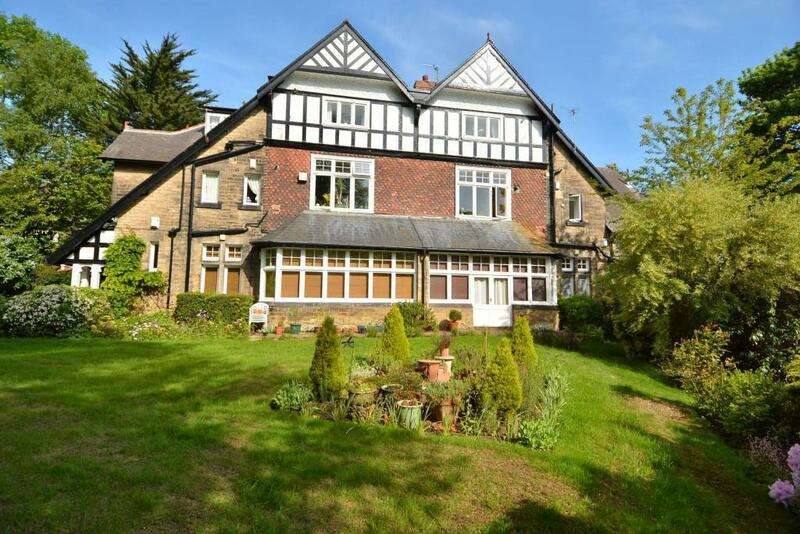 It is a detached 2 bedroom house (3 if you lived in London ) with lovely surrounding gardens. This was until recently a clinic run by the NHS it was accessed through Hall Lane from the back. 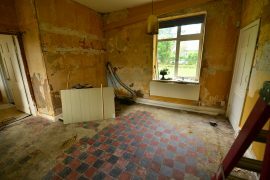 It is now going to be brought back to being a dwelling. 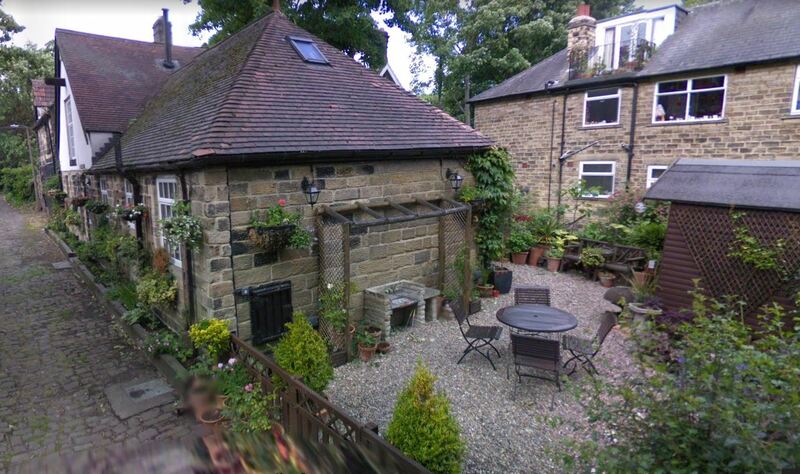 It is an unusual horseshoe shape most probably as it was the Gardeners cottage and the two sides were used to store tools and supplies in. 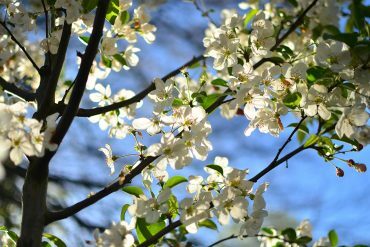 Great site – we love the history. 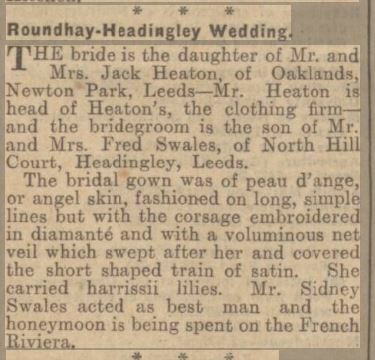 Please note that Francis Martineau Lupton (d.1921) is “Princess Kate’s” great great grandfather. 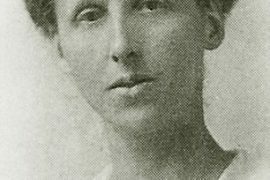 His daughter – Olive Middleton (d.1936) , nee Lupton is Kate’s great grandmother. 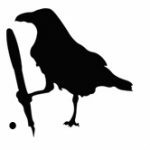 Hi Mike, yes we covered the Royal connection in this post great to hear from you again. 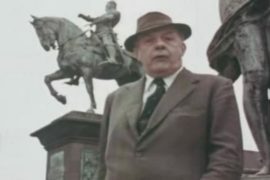 ‘Happened upon’ this blog when looking into Arthur Currer Briggs. 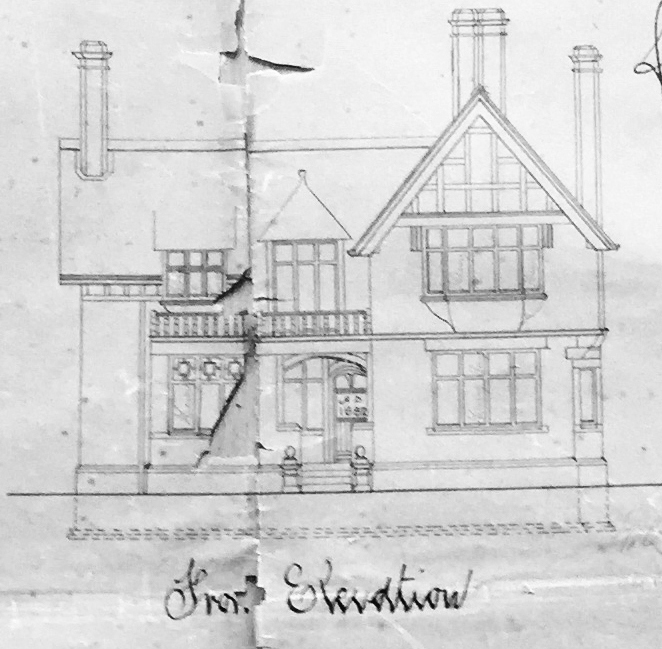 I’d been reading about his Arts and Crafts holiday house (Broadleys) in the Lakes, and noticed he lived in Gledhow Grange at the time. Fascinating personalities, history and architecture on our doorstep. 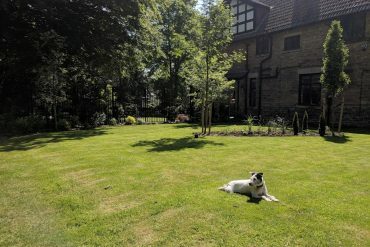 Really love your blog, and fantastic to see someone repairing a historic building with respect and understanding of the building together with 21st century flourishes. Interesting to read about the decision on the colour of the exterior paintwork. Think it works really well. I live in an Arts and Crafts inspired 1920’s house in Gledhow. 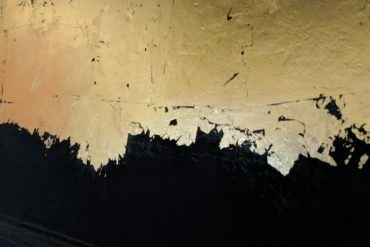 Just about to redecorate the hall and wondering if I’m brave enough to paint the stairs black or grey … Best of luck with it and I look forward to hearing more of the story. Your maps are great. Here is some clarification regarding one of them; it has the name Mrs O.C. Middleton at the top. 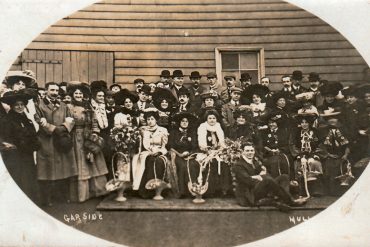 She is registered as the co-owner of the buildings (Rockland and its garages) and its surrounding acres with her sister Miss A.M. Lupton. Mrs O.C. 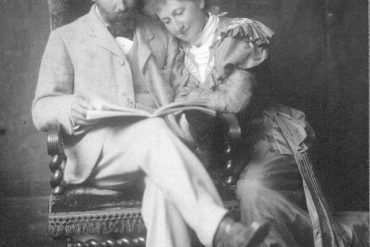 Middleton had married Richard Noel Middleton (died 1951) in 1914. 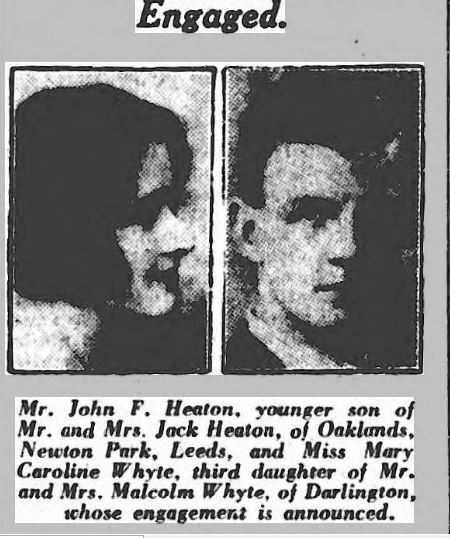 The sister’s three brothers were all killed during WW1 and could therefore not inherit any property – neither the Newton Park Estate nor the family’s Beechwood Estate in nearby Roundhay. 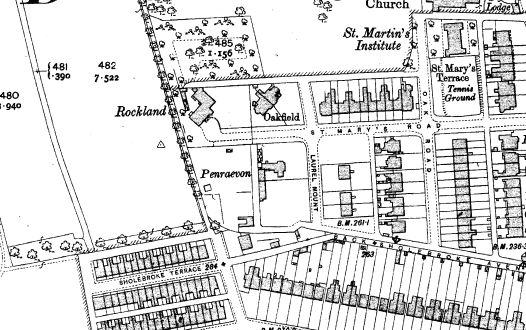 Newton Park Estate had been entailed to the siblings’ father, Francis Martineau Lupton (died 1921), alongside his three younger brothers. 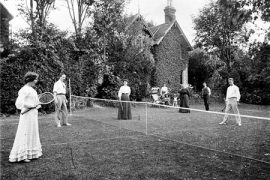 Francis Martineau Lupton ensured his two surviving children, Mrs Olive C. Middleton and Miss Anne M. Lupton, inherited a portion of their grandfather’s estate. 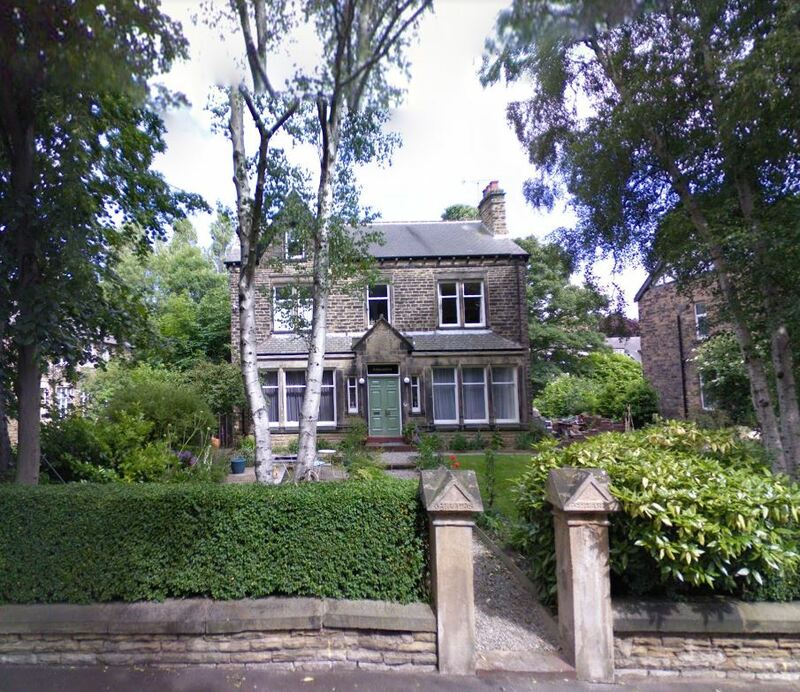 Olive and her husband Richard also owned Fieldhead House in Roundhay. 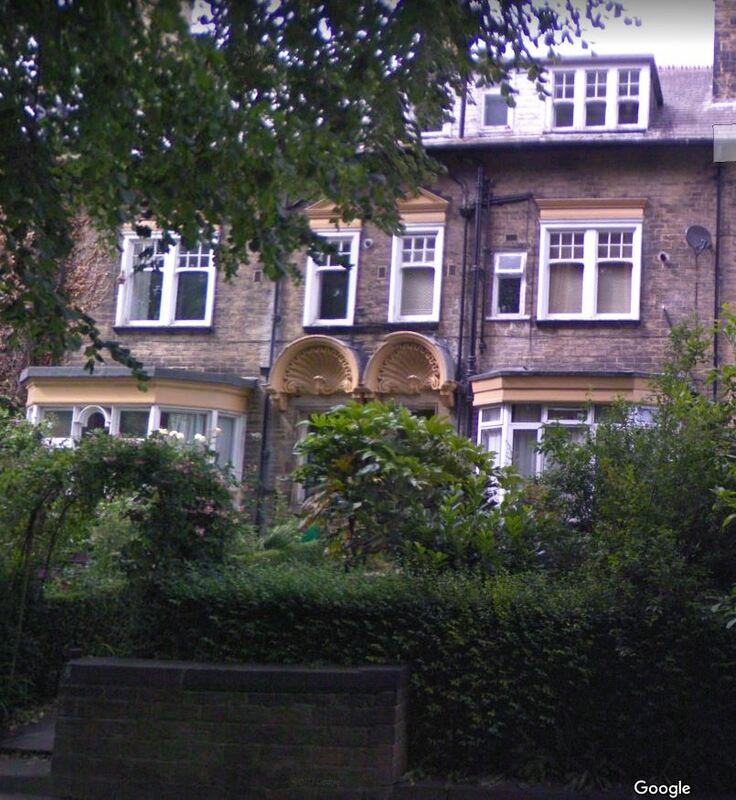 This was where their son Peter Francis Middleton was born in 1920. 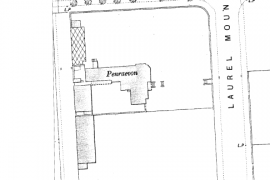 The date of the map concerned is c. 1921. The map is indeed an anomaly. I discovered it in a pile of documents held at the West Yorkshire Archive (John Hepper and Sons estate agents and surveyors records) and they cover the sale of Oakfield and the adjacent lot which dates 8th Jan 1920. 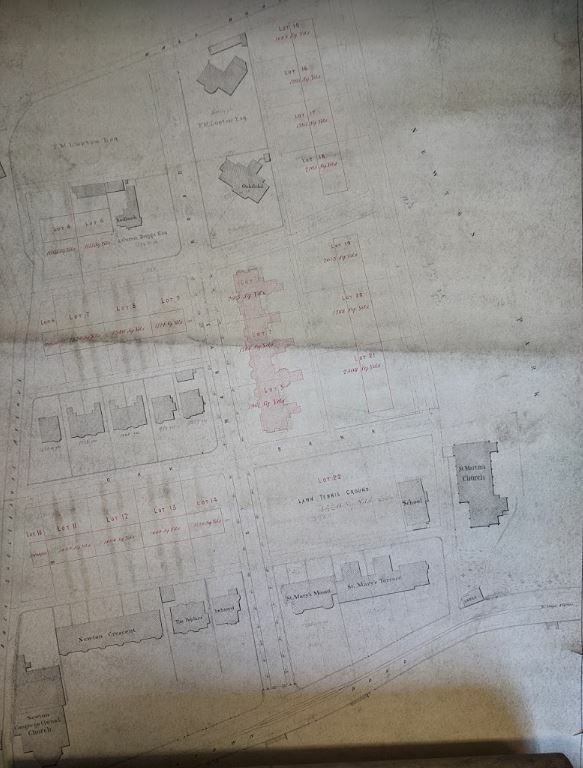 It is obviously an updated version of the map held in the deeds as it does not feature the buildings which were built between 1895 and 1920.